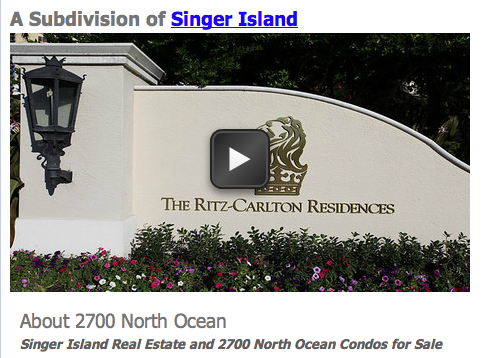 Luxury abounds at 2700 North Ocean, Singer Islands showcase 242 unit condominium development. 2700 North Ocean was built in 2008. Safety and security are paramount with a twenty four hour gate house with is manned. Residents can also expect a variety of amenities from 2 separate resort style spa pool each with Atlantic Ocean view points, an Incredible movie theater room, exercise / fitness facility, pool deck restaurant, and first class concierge with valet. service. 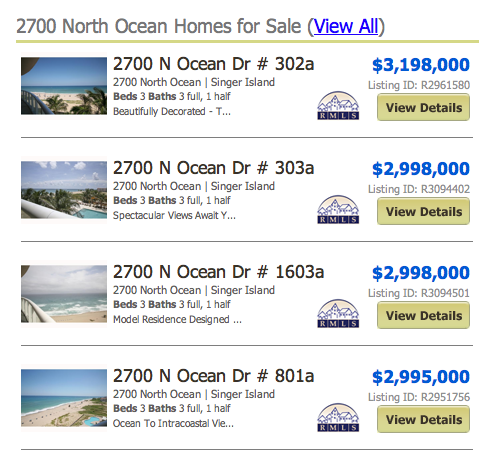 2700 North Ocean Condos online now. All listings & Sold Statistics! There are two separate towers, each standing twenty seven feet tall. Floor plans differ from 2-3-4 bedroom varieties. Living area can differ from starting areas of 2115 square feet under air to over 7000 living area of square footage on the penthouse. One of the unique attributes of 2700 North Ocean condos for sale is that like the name of the building, each resident will enjoy awe inspiring and unforgettable views of the Intracoastal along with Ocean viewpoints. 2700 North Ocean condos for sale in Singer Island Florida 33404 is situated on over eight acres of beachfront property along with three hundred seventy five feet of gorgeous beachfront access. The location is ideal and close to United States highway one. Access can be gained via Blue Heron or PGA Blvd. Residents who enjoy golf can belong to PGA National and play the 5 world class golf courses highlighted by the Jack Nicklaus Champion course and Arnold Palmer’s General golf course. Closer inland are public courses including a Nicklaus hometown course in nearby North Palm Beach. Restaurants and shopping along PGA Blvd are among the best in Florida. I95 will take you to Palm Beach International only 25 minutes away for easy access in and with daily non stops. If you like to cruise, Fort Lauderdale is the worlds largest launch point and many cruise lines are based here in Florida. Nature lovers can delight in MacArthur State Beach Park. Go to the beach, snorkel, kayack, nature walk or watch the turtles give birth on a guided nigh time tour. Posted in Singer Island Condos, Uncategorized on June 9, 2011 at 12:26 am.